This posting is from Melissa Hosek. 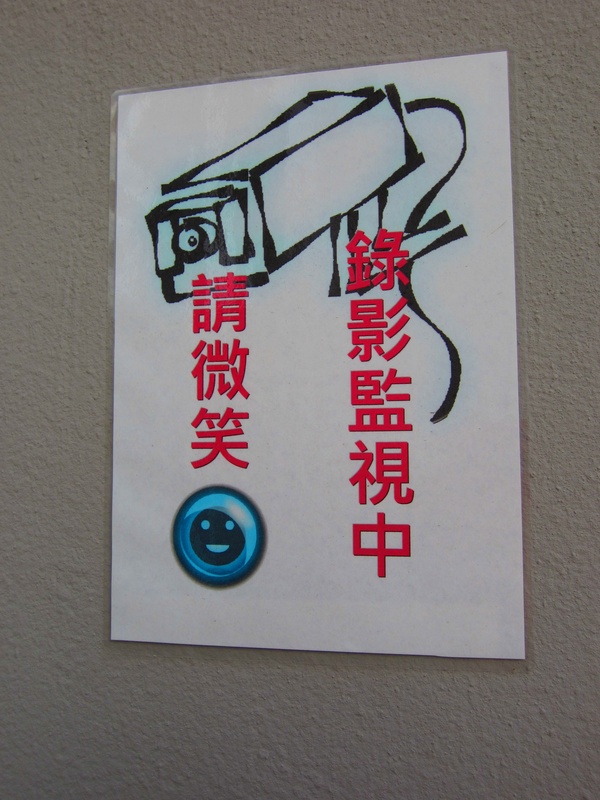 I found this graffiti on a building located by Wuming Hu, the on-campus lake. The building was covered with prayers and wishes from students and prospective students; some asking for help getting accepted into Peking University,others asking for good luck on exams and their futures. 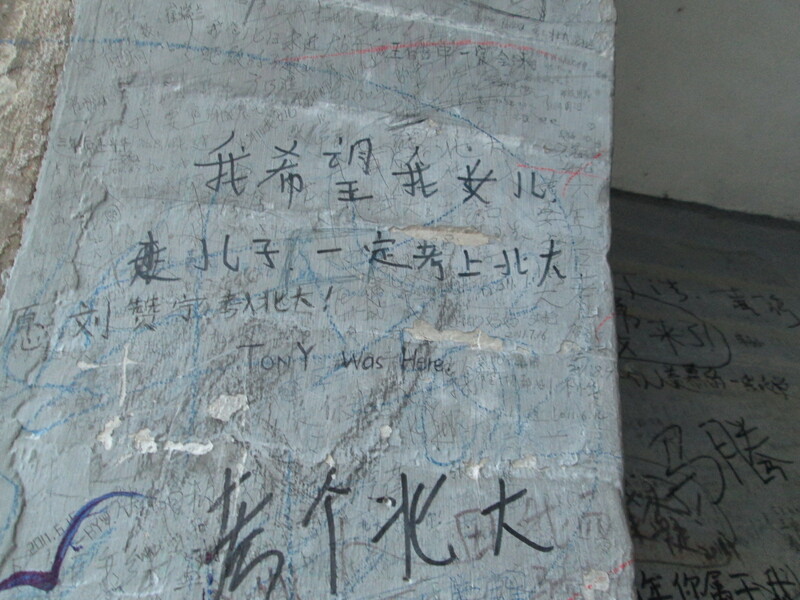 I translated this particular piece of graffiti to mean “I hope my daughter or son will be accepted to Peking University.” I wonder if this was written by a current student or by a future parent who visited he campus. Whichever case it may be, I am impressed by the devotion and loyalty of these graffiti artists have for Peking University. I feel so lucky that I get to spend a semester here. I like “Tony was here” in the middle. Very Zen. I take classes a short walk away from the guesthouse where I have been staying for three weeks. There are other buildings around the building where I study but I did not know much about them until I took a picture of this sign and had it translated. Apparently all of the Vietnamese I have been seeing in business attire work for the state and are taking a class in the building right next to mine. Maybe I should try talking to them about Vietnam and their work here. The other day I was at dinner with a friend. We were sitting at the same table as a man with his family. I was very interested in what they ordered because I like to see what people here enjoy eating most. We started talking and I discovered that he was an immigration officer from Cambodia. I learned that if I am a little more out going with people I don’t know, I can have some very interesting conversations. Move and park according to the regulations. Keep the ticket with you, if the ticket is lost, notify the employee as soon as possible. We don’t take responsibility for any personal belongings left behind. No smoking, no littering, no fighting, and no elbowing . Wear uniform, name tag and work at the assigned position, absolutely no smoking. Activelty help out the customers to park car at the right places. Sell tickets at the assigned rate. Make rounds and check on car on a regular basis. Have to right to refuse returning vehicles in case of mismatching tickets or suspicions of a thief. 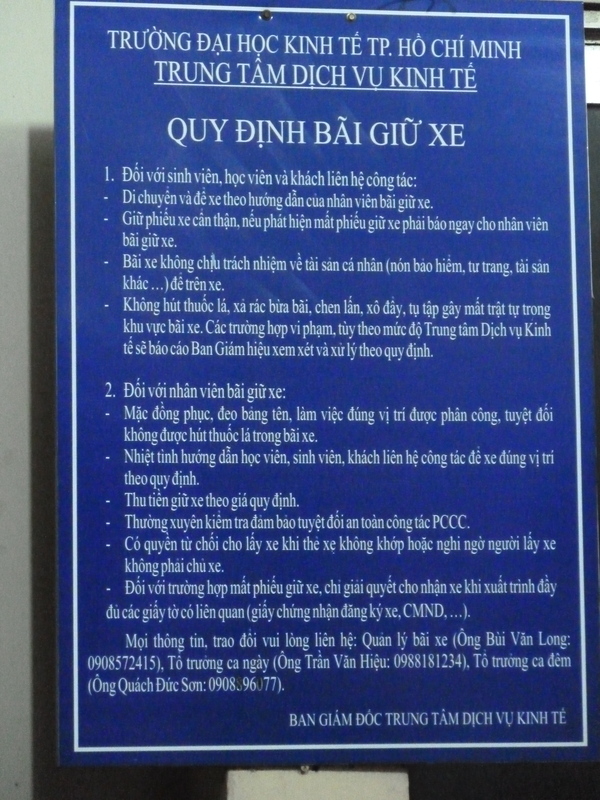 I thought that this sign was interesting because it says in the parking regulations that fighting is not allowed but while I have been in Vietnam I haven’t seen anyone get angry to the point of violence. I saw a motorbike accident in which no one was injured and none of the people were angry at the individual at fault. They just picked up their bikes and drove away as though nothing had happened. I am surprised that in the regulations no smoking is listed twice, once for the students and once for the employees. People smoke everywhere here whether it is allowed or not, which was confirmed by the smoking guards working when I took this picture. Those are great! It’s funny how something so simple can explain something you’ve been noticing but hadn’t yet formulated in your head as a question, like, “What are all these besuited people up to?” Imagine if you could read all the signs! Congrats, Appelsina7, you’ve earned your Vere Sandals this week. Keep on walking talking and learning! I saw it and thought it might say something interesting! In the US we have tons of signs saying things like “Watch your step” but I hadn’t really noticed any of that type of interaction here. Since that wasn’t something I had noticed, when I saw the sign I thought that it must be important if it was instructing people how to act. China National Day and Signs! Last week was vacation week at Peking University, thanks to China’s National Day holiday. Taking advantage of the break, I (along with eight friends) journeyed on to Shanghai and Hangzhou. 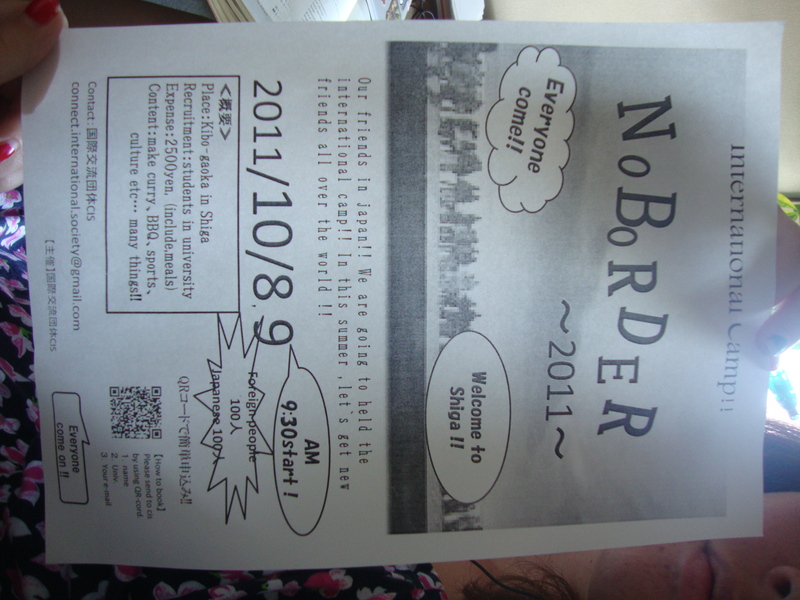 We took the bullet train (awesome) and stayed in hostels (interesting). The best part about our travel was that aside from the train tickets and hostel bookings, every day was completely unscheduled. No structured tour groups, no one dragging us along to sites we did not have any interest in seeing. What this resulted in was a wonderful week of wandering around both cities and seeing bits and pieces that never make it onto tourist trips. Hangzhou was especially fun for me, as I had not been there on my previous trip to China. 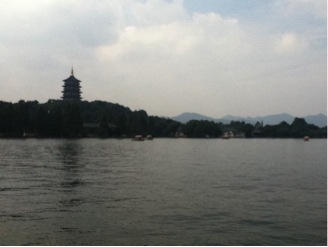 Hangzhou is mostly famous for one thing- XiHu, or West Lake. The lake is gorgeous, and areas around the lake are filled with parks and lovely sites to see. The fantastic thing about this sign is that in context, it makes sense. Out of context, it looks like a man with a raygun shooting lasers attached to his arm. Its actual purpose is to tell passengers to be careful breaking the window with a nearby hammer (if it needs to be broken). 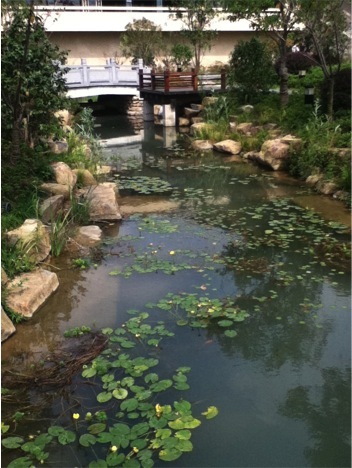 The bus ride eventually led us to an amazing meal in a tiny restaurant, and then a visit to an amazing park outside a song dynasty museum. Yes, that is Uncle Sam inviting you to purchase real estate from “Kevin”. This sign was in an area with no other English businesses, and very few other foreigners in general. There seems to be absolutely no reason for the business to use Uncle Sam. 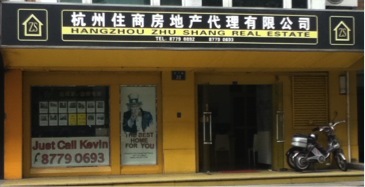 There is no American aspect to the company (the sign above the building says the same thing as the English, just that it’s a real estate business). The only explanation seems to be that Uncle Sam is a recognizable symbol, and might be used to attract attention? I urge you, dear reader, to try to figure out any possible other explanation. Oh, how I love Engrish! Yup, you read that right. 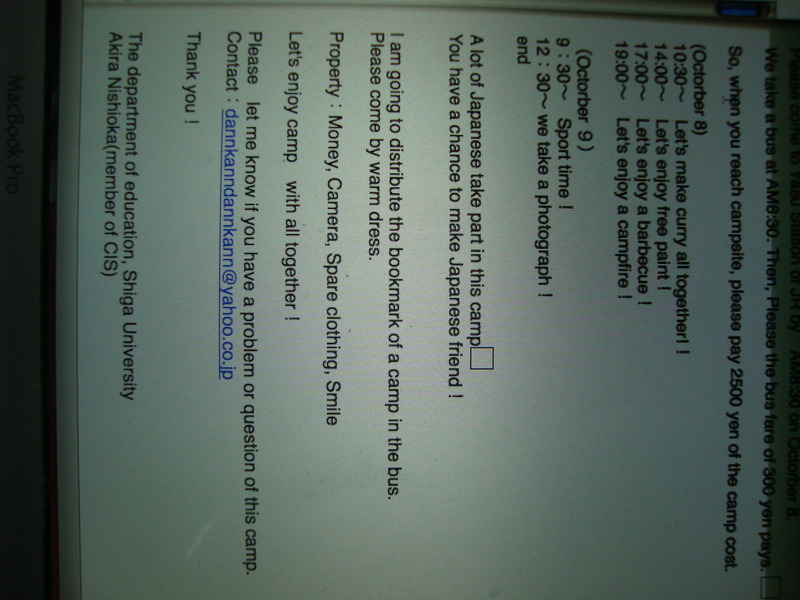 “Engrish.” It’s this wonderful new sort of English spoken by Japanese native speakers. And it is everywhere! To give you some idea of just how popular this new age written language may be, I have a short story. 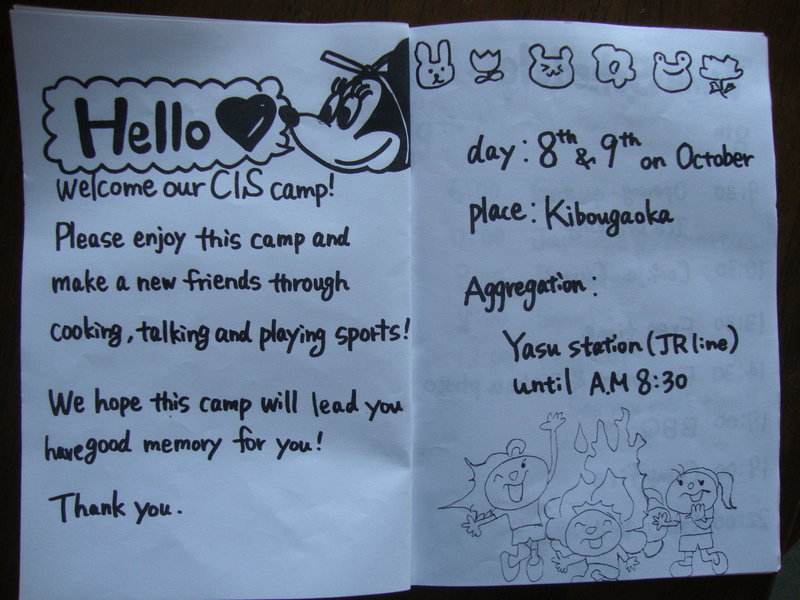 Upon our arrival, we received mini booklets of information about the camp and what to expect over the course of the next two days. 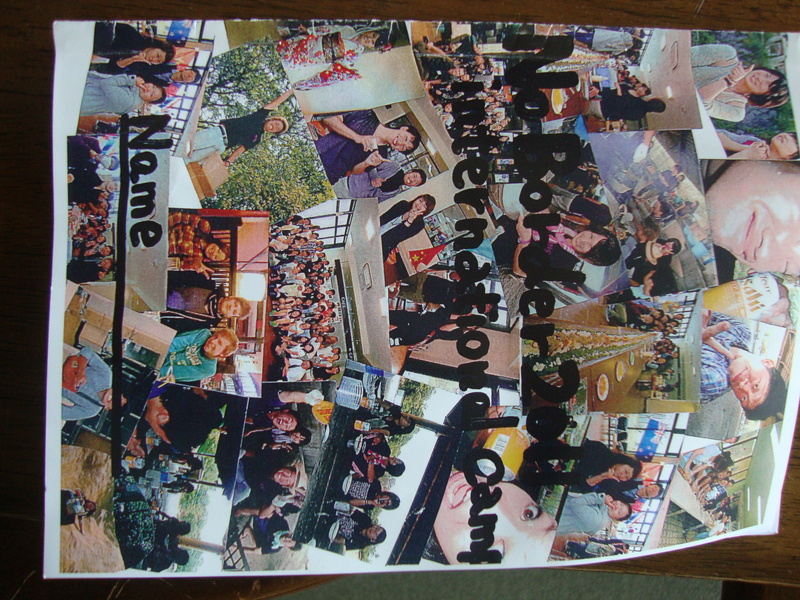 The front of the booklet was covered in colourful pictures of previous years camping events. The inside of the booklet was filled with cartoons…and more Engrish. We would “make a new friends” (just one) and “lead” us to “have good memory.” Even better was the usage of the word “aggregation.” Certain words are certainly more important than others. The drawings of kids playing and a smiling Minnie Mouse were adorable! 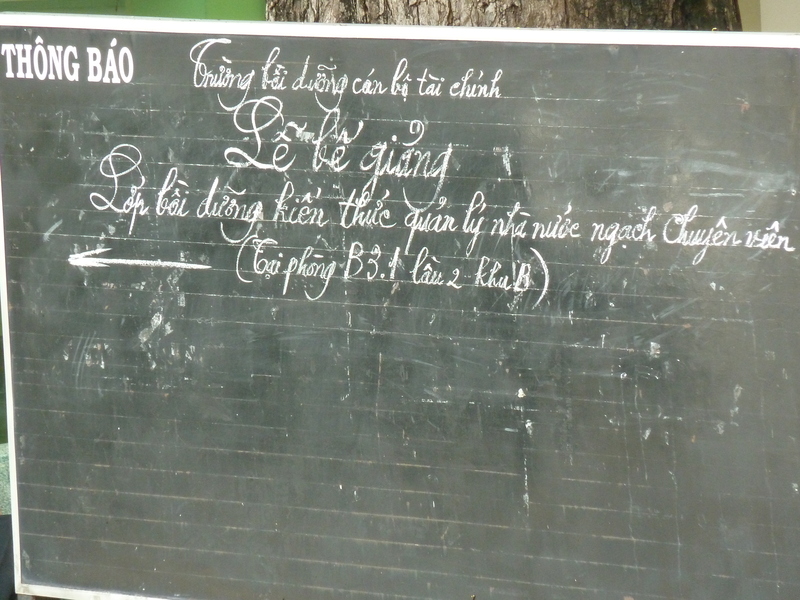 This being only one example of the popularity of this new form of writing, there are numerous other places around Japan where such language can easily be seen. And I enjoy every word of it! 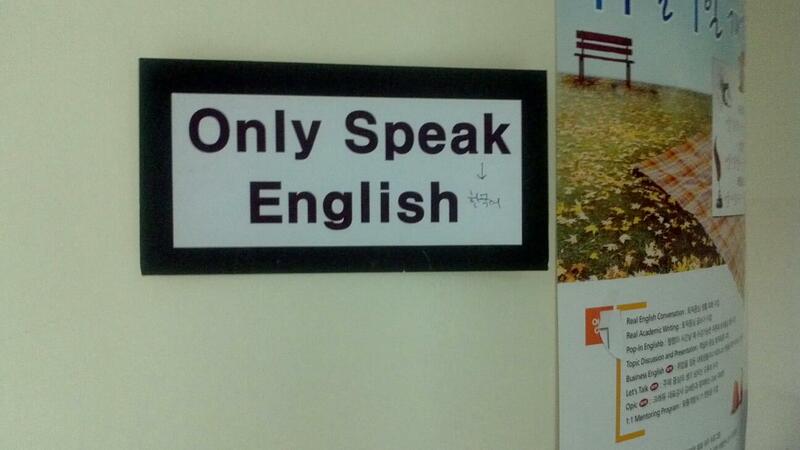 Oh, Engrish! How you amuse me.